an imminent danger, a constant threat, especially in the midst of prosperity. Damocles was a sycophant, a fawning admirer of the tyrant Dionysius II of Syracuse. One day, after he happened to mention (again) how he admired the opulent lifestyle of Dionysius and how fortunate he was to have it, the ruler asked him if he'd like to give it a go, to experience the lavish and privileged life of a powerful man like him. Of course, Damocles was all too eager to take the chance, and was soon sitting in the throne of Dionysius, enjoying all the trappings of a man with such power. However, Dionysius had sneakily arranged for a sword to be hung above his throne by a single thread of horse hair. When Damocles noticed, he was perturbed to say the least, and was soon begging Dionysius to restore him to his humble (but safe and swordless) station. Thus, Dionysius had taught Damocles the precarious nature of the life of the man in power, and the Sword of Damocles has become a famous metaphor for living under such constant threat and imminent danger. How annoying for poor Dionysius that it was the fatuous Damocles who ended up with practically all the fame. If you're going to teach someone a lesson, don't teach them in too memorable a fashion or the lesson (or the subject of your lesson) will be become more famous than you, which will be especially irksome if said lesson somehow pertained to your notability in the first place. Hmm. I think I could word it better. Damocles was a sissy... he should have moved the throne into the other side of the room. Simple as that. You're right, Teresa. 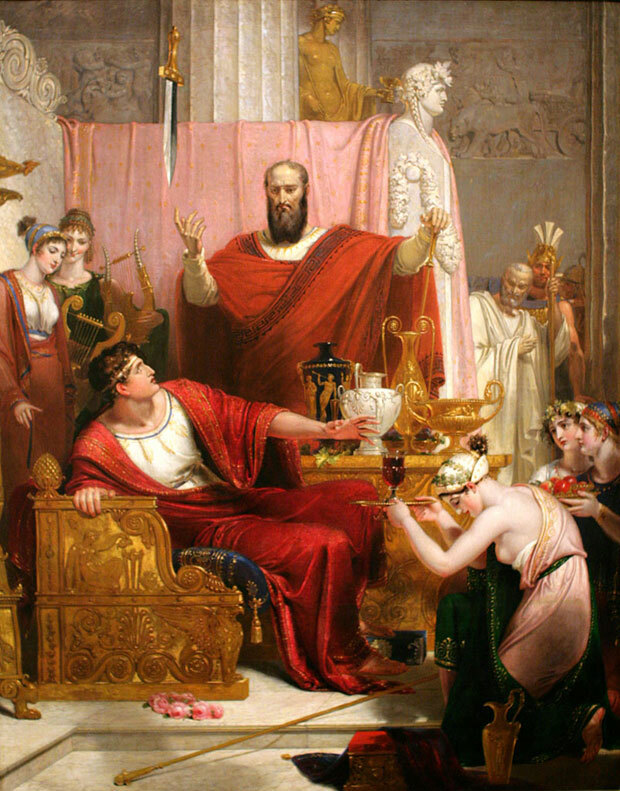 While it's a good story, there is a flaw in Dionysius's offer; if Damocles really was to experience the full breadth of his position and power, then he would have been able to just order that the sword be taken down. But as he didn't (or couldn't), he didn't really get to experience the position of Dionysius at all.